During the election campaign, Mr Rudd was seen holding up a notebook PC, calling it “the Toolbox of the 21st Century“, then announcing that if elected, he would provide every Year 9 to 12 student in the country a computer. Now with victory secured, work has actually started with the first round of funding to be delivered in July to allow for these computers to be ordered – catching most education authorities and independent schools by surprise. With the equivalent of $1,000 provided per computer, per student, this represents a massive increase in ICT funding in school education. As soon as the announcement was made, schools and each State started to think of the ACTUAL costs of providing a computer to each of these students. Aging power supplies in schools, inadequate networks, furniture, accommodation, storage, security – the list goes on and on – each item with its own price tag. Increasingly, schools started to realise that desktop PCs were out of the question, and even full-size laptops were disregarded due to the impending damage to our children’s spines. So it appears that a form of sub-notebook – possibly specially designed for Australian school needs will be required. Thanks to the global influence of the “$100 OLPC Laptop“, several companies including Asus, HP, Dell and Intel have produced sub-notebooks, all less than US$500 and all in the running for a slice of Australia’s Digital Education Revolution. The change leftover can then be used to buy all the sundry essentials that will be needed to make these notebooks work in a school setting. But in a country with six State and two Territory governments that each look after school education in their own way, plus the various religious and independent school systems, there is little hope that Mr Rudd’s plan can produce the desired SINGLE revolution. There is every chance that there will be EIGHT different solutions adopted across the country with the funding distributed to the states. The problem is not sourcing or delivering the Notebooks. The problem is not the required wireless access, nor the Internet bandwidth, nor the battery life, nor the software and not even the warranty or on-site support nor the ongoing reimaging needs. All of these minor concerns can be overcome. From a pure ICT perspective, the job is not difficult – it just needs money, and it seems there’s plenty of that. The real problems are not technical problems at all – they are all social problems. Teachers are conditioned (and expected) to deliver the syllabus. A syllabus designed to fit into a rigid structure with an inflexible examination process that is the key measurement benchmark. We teach facts and we expect our students to regurgitate facts under exam conditions – and that hasn’t changed since… well… ever. On the other hand, ICTs extend horizons. They introduce new concepts. They promote critical and free thinking. They extend students by expanding opportunities for creative output, shared learning experiences, outside and global communication. Human Interactivity through technology. If they deliver a notebook to every year 9-12 student WITHOUT completely revamping the curriculum and syallabi, they risk ICT anarchy. To my way of thinking, you cannot allow the hardware and the technical solution to be delivered WITHOUT the education framework authorities seriously taking into account the enormous influx of ICTs that are coming soon and for them to change current educational expectations. 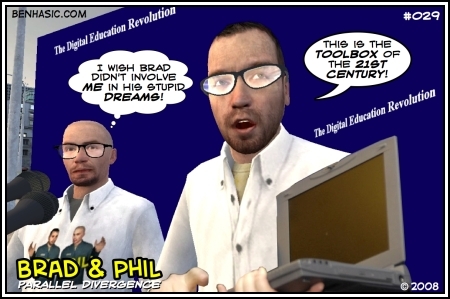 If they try to “shoehorn” the new Notebooks solution into the existing curriculum by simply “implementing a professional development program around the use of the laptops in classrooms“, then they are NOT being serious about a “Digital Education Revolution“. Across the world we’ve seen the impact of ICTs in school education over the past decade or so, since the introduction of Internet access and the ongoing smaller computer rollout programs. Over this time, enormous amounts of money have been spent often for little or no educational change. If we did a cost-benefit analysis of computer rollouts and scrutinized classroom internet usage over the years, we’d be hard pressed to justify this expenditure. The real problem, as I see it, is the use of ICTs in school education has always been and still is – in 2008 – an opt-in resource. For 10 years, educational authorities have been tinkering around the edges and walking on eggshells around teachers when it comes to integrating ICTs into the education of our students. That is because the already-full and concrete curriculum tells teachers that they “could” use ICTs as an “add-on”. But the world has changed incredibly in just the last 20 years. You only need to glance at what our teenagers are doing using ICTs, independently of school, to see that many of our young produce more “work” and display more creative and critical thinking on a daily basis at home than they would in a whole day of set lessons at school. This is not just a problem in Australia – it’s worldwide. To borrow from Mr Rudd’s campaign-speak, we are at a fork in the road. We can choose to keep pouring more ICT money into the bottomless-pit of our 1950s education systems in the hope that a few more teachers might become beacons for the masses to (optionally) follow, or we can really and seriously start to shape a new, modern, underpinning education system for the 21st century. Both of these options will appear to voters that we are doing something positive – but only one actually will be. In the term “Digital Education Revolution”, of the two adjectives, I believe “digital” should hold 10% weight, while “education” should hold 90%. To me, the Digital Education Revolution is NOT an ICT project – and whilstever educational authorities see it as one, it is destined for failure. Don’t get me wrong, I’m very optimistic and excited by the potential for this Revolution to change the face and future of a whole nation, but unless unprepared eyes from all education authorites are opened and unless the will for true education revolution is there, we’ll continue to do a lot of ICT work for little gain. Feel free to discuss in the comments. As a high school teacher in Queensland, I’m terrified of this project. Not terrified for me, but for the 70% of teachers at my school that refuse to use technology with the students. I think you’re absolutely right. We need to change the syllabus and integrate the ICT resources into all subjects. As a IT CEO and founder of shoutoo.com, i believe this is a great idea from a new government. I believe that teachers are also learning just like the kids. I droped out of school at the beginning of year 11, I believe that if i had a computer, and classes that were in computer engineering i might of stayed at school. I dont believe that computers should in the math classes or English classes or any language. But I do believe that this is a great idea from a new government. Here in Victoria, we’ve been making moves for a few years now on providing better technical support for ICT in schools and it’s been making a difference when teachers can rely more on the technology. Basically, if a teacher’s been burned by the attempted use of computers with a class, they still hesitate to use them when they can always revert to the tried and proven blackline masters and the good old text book. The image of the students opening their laptops for the first time will be terrifying for many high school teachers. I agree completely with Jennifer – and with you PD. This is a social and educational problem – NOT an IT problem. Teachers here in Vic have had the opportunity to get a laptop for years, but the take up rate hasn’t been great. Meanwhile the kids will jump at the technology – leaving us even further behind and more irrelevant by the day. Unlesss this D.E.R. is managed really effectively in the school setting, it will be a disaster. @Marko – You should be terrified about that 70% statistic and I think that across the whole country, most high schools would have a similar if not worse statistic! @Russell – Congratulations on your early success. It’s quite clear that many students go off to jobs that bear NO resemblance to anything they learned at school. As for high schools preparing students for the workforce? It’s just not happening. @Jennifer – I’ve seen some of the things happening in Victoria. I think you’re very lucky down there with so many schools in such a small state. You don’t have the tyrannies of distance that most of the other states have to worry about. Positive change in Victoria and Tasmania SHOULD be achievable, but it still sounds like you’re not there yet. @Paul – The teacher laptop program in Victoria has been the envy of other states. But until EVERY teacher has a laptop AND uses it for education purposes, we’re really going to struggle with this Digital Education Revolution. Thanks all for the comments. Keep them coming! I have a 15 year old son who attends a highly selective state high school. At this point he is bored and disengaged with school and seriously underperforming as a result. Kids are still expected to made to work on page after page of meaningless and repetitive algorithms with out any obvious application to the real world. To my mind the use of technology to take care of the calculations should be freeing up young mathematicians to work on challenging and relevant problems. The thing thing which I find most disturbing is that the reluctance of inabilty of teachers to take up new technologies does not seem to be peculiar to older teachers but is prevalent across the profession both young and old . Assessment methods, curiculum, the organistation of teaching and learning enviroments and teachers/student dynamics all need to be rethought . Hi Barbara. Unfortunately the Selective High Schools have a harder job at being relevant in today’s world. Their main purpose is to produce students that excel in the academic structures that were produced all those decades ago. They are producing students that are best matched to the system – regardless of whether the system is right or wrong. Your statement about even new teachers being “reluctant” to take on the new technologies is completely indicative of the rigidness of the curriculum and its inability to move with the changing environment. New teachers want to “toe the line” – they don’t want to rattle the cage. Sticking to old ways is not helping the profession change. The thing is, teacher’s feel safe where they are now. If things were to change, then there could be major upheval to overcome. And parents don’t help either – they expect of school what they got out of it – they way it worked for them. They want grades and class rankings in reports because that’s how they were scored. But everything’s changed. The longer things stay the same in schools, the more irrelevant schools will become. I agree wholeheartedly with your comments. The Digital Education Revolution is NOT an ICT project. I’ve been reading a lot of inspirational material lately (courtesy of Judy O’Connell’s site, which is incidentally, where I picked up your blog at http://heyjude.wordpress.com/2008/05/26/digital-education-revolution) about Web 2.0 technologies in education and the critical need to rethink pedagogy and the whole curriculum framework. I’m coming from a primary educator’s perspective but I don’t feel it’s any different really to what the high school teachers are experiencing – perhaps, a little more lee-way on the scope of the curriculum and teacher innovation in the area of ICT. The new learning competencies which are evolving for our ‘digital natives’ using the Read-Write Web, will cause those 70% or so of teachers, who are not using technology at all with their classes, or who are using it simply as an add-on, to feel even further removed from it all. Time and money needs to be invested in significant teacher professional development in this area in order for networked learning communities to grow. The majority, of these 70% of teachers that we talk about, are good people who have the very best interests of the kids at heart. For whatever reason, they have not reached the same point as others in their knowledge or use of ICT – it doesn’t mean that without the right guidance or input that they won’t or can’t change. I agree with Russell, who left the comment that teachers are learners too, just like the kids. As for the question of syllabus change and the rigidity of the curriculum, I don’t know what the answer is there…especially with politicians buying into such areas as assessment (A-E reporting, for example) and refusing to listen to the voice of educators; and with education authorities sticking to a comfortable and outdated system of education, which arose from an industrial revolution age. Teacher Advisory committees seem like a good starting point. I don’t dispute the teachers themselves are good people with the best interests of students at heart – it’s the combination of the education system and the teacher’s union that does not motivate and encourage them to increase their skills. The problem is becoming critical and will soon push many of our aging educators into retirement, leaving a staffing shortage unlike any we’ve ever seen before. Thanks for the welcome, P.D. 🙂 Yes, I saw your class blogging series. I was lurking around your blog before and stumbled onto it. I haven’t really read it fully yet but did use your link to have a look at the great youtube clip you added, ‘The Machine is Us/ing Us’. Really thought provoking. I’m thinking it would be a good stimulus for conversation at a teacher staff meeting. I would like to start blogging with my class but am not sure of what is/not allowed in my system. I’m not with the Department of Education so can’t comment on the measures in place there. Excuse my ignorance, if you have gone through all of this in your class blogging series…I’ll catch up with you soon. I did read your comments in reply to someone who was expressing doubt about the need to showcase student work outside of the classroom/school environment in the public arena. I’ll probably use your response (with acknowledgement to you, of course) to help put across a more persuasive argument to my supervisors as to why it’s a good idea. What really resonated with me was your comment that blogging is more than an electronic journal. It’s a means of connecting with others and especially of tapping into people (experts in their fields even) you would otherwise never have the chance to engage with your students. I’m glad you don’t dispute that the teachers themselves are good people. There are plenty of teacher-knockers out there and I don’t think it does anything for teacher morale or for the profession, which is in bad enough shape. Even old dogs can learn new tricks…as a mature teacher I think I’m a pretty fair example of that. You yourself said that you’re “jumping into the blogging scene relatively late. Things change”. Your comment on the education system and the teacher’s union not motivating and encouraging teachers to increase their skills is interesting. In the education system in which I work, every teacher is required to participate in a certain number of hours professional development in school time and in their own time – part-time teachers pro rata. There is a fair degree of scope for choosing your own focus areas, too, and switched on school executives have the chance to give people a nudge in the right direction if necessary. The Independent Teacher’s Union is available should teachers need their support if they think they’re being unfairly treated but otherwise supportive of teachers increasing their skills. Judy, you’re more than welcome to use what you find here. Let me explain more what I was referring to with regard to “the system” and “the union” stifling teachers. Firstly, the system – I’m referring to public education in NSW here. Teacher leaves university, gets a permanent job in a school. They’re all excited and wanting to do great and wonderful things and the Board of Studies gives them the (ICT-free) syllabus. Then they realise, for the next SEVEN years, they don’t have to do anything to get a payrise – they just have to show up. If after those seven years, they want to take the next step, they have to take on administrative duties and responsibilities often in addition to teaching. Where’s the motivation? Teachers that do put in their own effort as “professionals” to teach themselves about the new tools of their trade are often frowned upon by the rest of the pack because they make them look bad. “Then, when governments and departments want to introduce technologies such as teacher email and now interactive whiteboards, threats of union bans are raised further holding the profession back. Personally, I’m in IT. I *have* to keep up with my industry myself if I want to survive. I can’t remember the last professional development course I was sent to. Upskilling is a personal responsibility for me and for many other professions. But somehow the teaching profession believes that upskilling existing teachers is the responsibility of the employer. You can’t be upskilled if you don’t want to be upskilled. And therein lies the problem. Thanks for clearing that up for me. What a shame! Thanks also for the link to Podcast Lane. I will take advantage of the great information you have there on setting up a class blog etc. I’ve been networking recently with some wonderful teachers in the public system here in Sydney, and also in Scotland, and am hopefully going to work with them in the future around using new technologies more effectively in the classroom. They’ve already got school/class blogs, podcasts and flickr albums happening and have offered to get me started when the time comes. Go on…you can say it! 🙂 I might still like to act like an ostrich with its head in the sand though. Who coined the term ‘e-maturity’ – Professor Pegg? Very clever. At an ITC professional development day recently, staff who are proficient in the use of various computer technologies teamed up to mentor the ‘e-mature’. A great day was had by all and confidence levels and use of computers in the classroom (as teaching tools rather than just to teach computer skills) at our place are on the rise. Still patchy but progress is progress nonetheless, no matter how small. I still think there’s a lot to be said for networked learning communities.